A corporate website has many jobs to do. One of the ‘boring but essential’ tasks is to direct visitors to different sites on a company’s web ‘estate’ as efficiently as possible. Here, Jason Sumner looks at six of the best online directories for visibility, presentation and usability. Many people arrive on a company’s corporate website when they really should be on another site in the company’s online estate. A customer looking for product may be better served by a country or brand site that sells products, for example. Local journalists may want to find out about the brands available in a particular country or see the list of social media channels they could follow. In these cases and others a clearly signposted, well-presented and highly usable directory is a perhaps unexciting, but necessary tool that can make the difference between a successful visit or a frustrating one. From a website governance point of view, a well-executed directory can make a complex estate of country sites, brand sites and social media channels more coherent and manageable. Here are six of the best in the corporate online world. 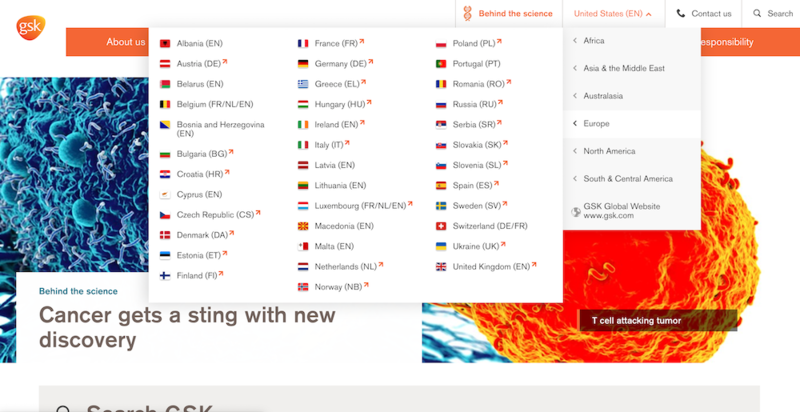 GSK's country-selector menu features a complete listing of GSK countries with links to country sites where available and country information pages where no such site exists. A 'new window' icon helps to differentiate between the two types of links. The menu is replicated on country sites, where it serves as a hub for movement around the estate. A link back to the global site is prominently included, which is good practice. 'AstraZeneca websites', in the header menu, launches a menu page which includes not only country sites but also customer, careers and social media presences. The link is present on most AstraZeneca sites, making this an excellent hub for the estate as a whole. There are some weaknesses too. For example, languages are not signalled via the menu. But on balance this is a simple approach which could be adopted usefully by many corporate online estates. A multi-tier dropdown menu on the ‘Our brands’ page, which has entries for product categories, countries and brand name, makes the task of reaching one of the company’s brands from this page on the global site easy and intuitive. In addition, a major strength of the tool, as we noted in a recent BC tip, is the fact that it provides country contact details for brands, without visitors needing to leave the global site. The ING corporate site home page has a prominent panel titled 'Find ING in your location'. It users location-sniffer technology to present the user with a default country setting ­– eg 'ING in the United Kingdom'. Clicking on the panel reveals a tailored list of onward links to customer ING sites relevant to the user's country. A simple 'Select other location' dropdown menu allows users to choose another country, and thus tailor the list of onward links. The same tool can be accessed throughout the site via the 'Products and services' primary menu link. This is simple but effective. SAP’s country finder in the universal header is a powerful tool to move around the web estate. A country and region selector, signposted with a small flag icon in the header of all sites, calls up an overlay panel from which visitors can click the country or regional version of the site they need. Like ING, the tool uses a location sniffer, but allows visitors to decide whether to use it before sending people to a site. The country name is presented in the language of the site – in the German version, Switzerland appears as ‘Schweiz’, and in the French version, it appears as ‘Suisse’. The menus appear across all country customer-facing sites and the ‘about’ corporate pages which are in English and German. Users can also access country sites from a ‘Worldwide Directory’ link in the footer. HSBC provides journalists visiting the media section of its global site with a simple and straightforward list of all of its global and local social media channels. They are first organised by channel – Twitter, LinkedIn, Instagram, Facebook, WeChat and YouTube – and then by ‘global’ and ‘local’ channels. Users can drill down through a series of click-to-expand menus. There are few bells and whistles on the page, but journalists – as well as other audience groups – are likely to appreciate the efficiency of the tool for deciding which social media channels they should follow.